The kitchen of the lodge style house would be the most important space in the new build. The homeowner wanted it to be SPECIAL. Unique. A modern farmhouse kitchen – bright and cheery, but sophisticated as well. 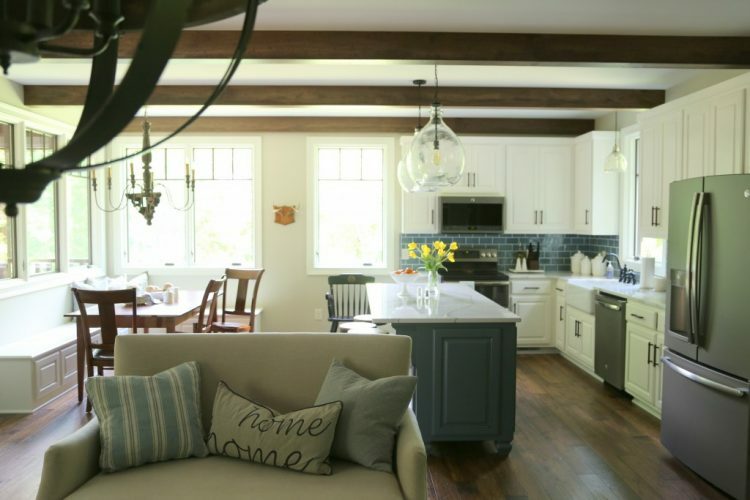 Antiqued or glazed cabinetry is too trendy and will soon look dated. It would also read yellow with the white trim planned for the rest of the home. Small samples of countertop material can be deceiving, and because I had seen this particular countertop installed, I knew it would be WAYYYYY too busy. I explained to my client that unless she wanted dirty-looking cabinets and black snakes slithering all over her work surface, I would go another direction that would make the kitchen SPECIAL in the best of ways. 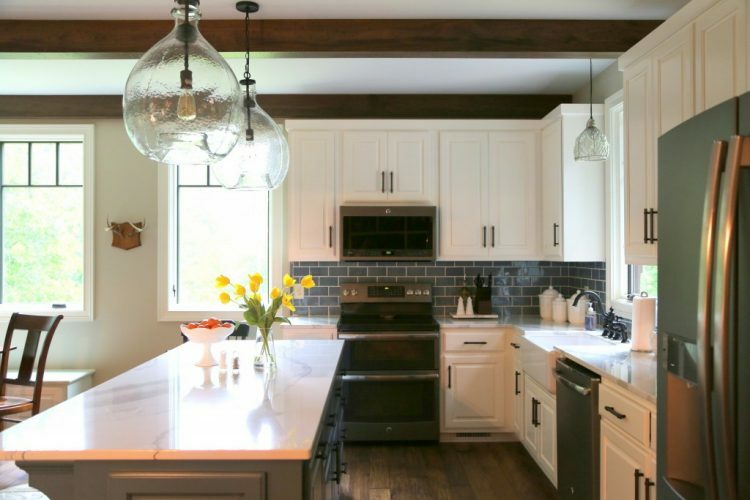 And the resulting kitchen in this modern farmhouse is the talk of the town! 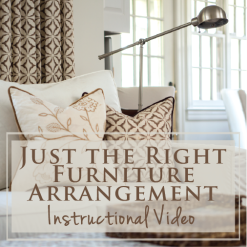 I’ll explain in a minute – first let’s take a look at the finished kitchen. 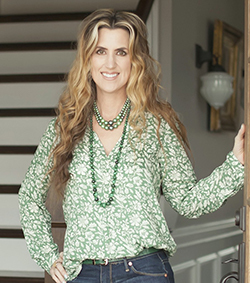 A week after the homeowners moved in, News Channel 5’s Talk of the Town came over to tape some segments where I shared design tips for viewers. Here I am with the lovely host, Meryll Rose, as we discuss how I developed the color palette throughout this space. 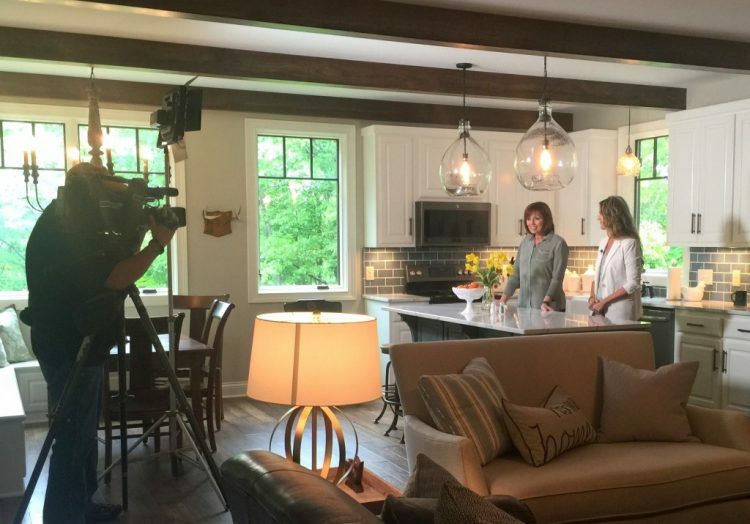 Make sure to tune into WTVF’s Talk of the Town at 11:00 on Monday and Tuesday to hear my advice for choosing light fixtures in an open concept floorplan, and for establishing an interesting color palette to create a cohesive flow in your own space. You’ll get to see more of this beautiful home! And if you can’t get enough of design, maybe it’s time to consider launching a career in the field. I can help you with that! 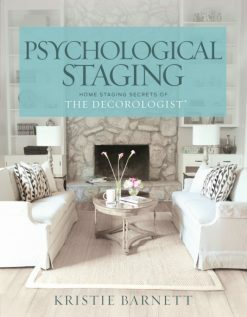 My next Expert Psychological Staging certification course takes place March 14-16. The course is already half-full, so reserve your spot and change your future forever! I’d love to hear your thoughts on my take on the modern farmhouse kitchen. 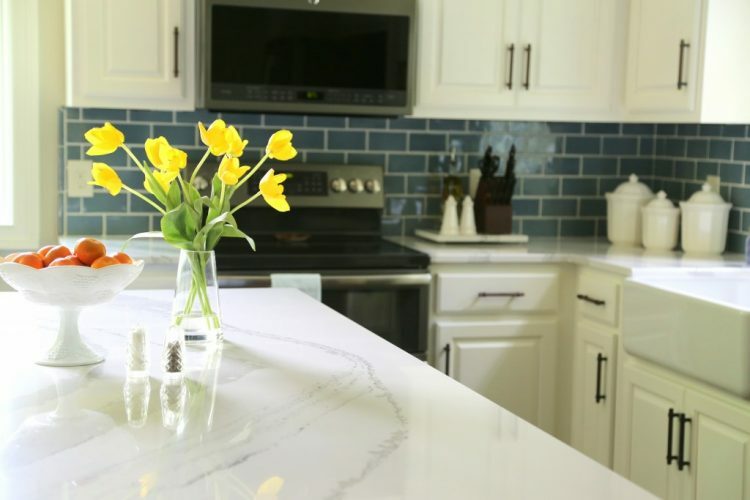 Have you ever seen or used Cambria Brittannica quartz countertops? 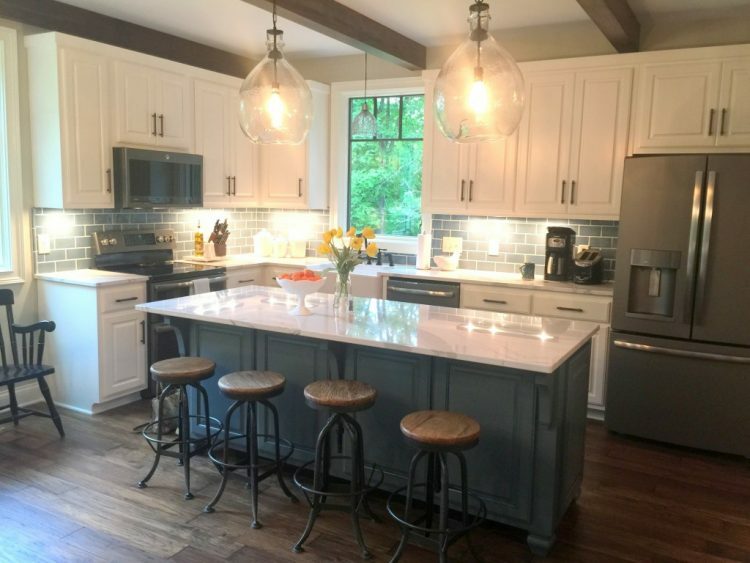 This entry was posted in Design Intervention, Popular Posts and tagged backsplash tile, blue subway tile, britannica, countertops, decorologist, design, farmhouse, kitchen design, lodge, meryll rose, modern farmhouse, nashville, quartz, talk-of-the-town, wood beams. Stunning as usual my dear friend:) So proud of all you do! 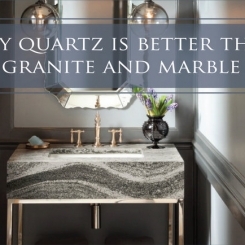 The quartz countertop is lovely! What a great tip regarding the size of a small sample vs a full slab, and how busy a pattern can be! Love the white cabinets; is the paint color your favorite Benjamin Moore Dove White? Thanks, Laura – it’s Benjamin Moore White Dove, not to be confused with Dove White (which is a Porter color). White Dove all the way! Beautiful! What color is the island? It’s a custom color to match the blue tiles, Kathy! Kristie, I really enjoyed reading this article. You always do such amazing work! Your way of helping clients choose timeless finishes to put together a great space is remarkable. Oh thank you so much, Dominique! I hope you are doing well!!! Absolutely beautiful! ps: Happy Mother’s Day ? Kristie this is beautiful!! I love Brittannica. 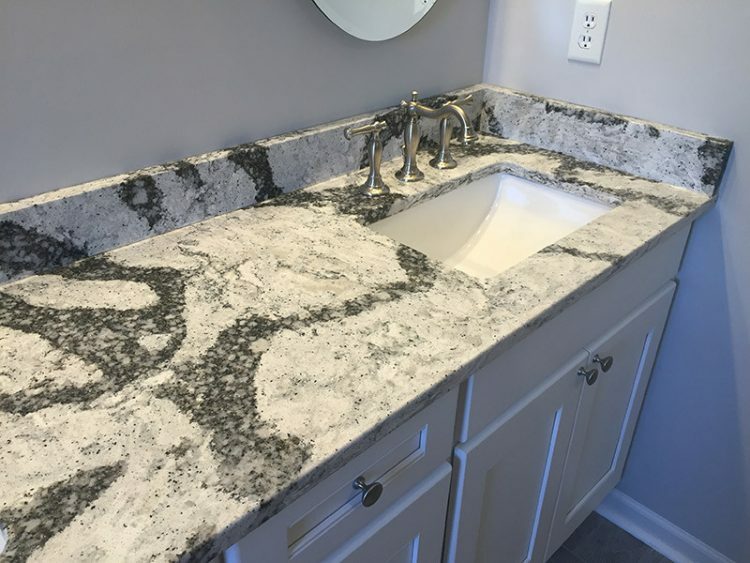 I’m currently considering using Cambria Torquay for a remodel – Brittannica’s scale won’t work in this space. I’m wondering if you’ve used Torquay. I love it but I’m worried it will read solid white. Thoughts? Torquay is lovely! I’ve used it as well. It’s more white, but it’s great. Not as much movement as Brittannica, but it’s a classic! I am currently adding a new kitchen to my home. 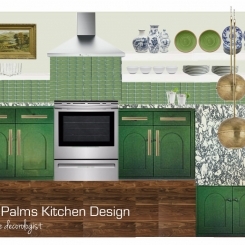 I had my heart set on antiqued glazed cabinetry, now I’m second guessing my decision. 🙁 Do you really think they will look out dated in a couple years? Also will the white not show finger prints and dirt worse? Thank you so much for your advise! I agree I want to know if they are dirty. 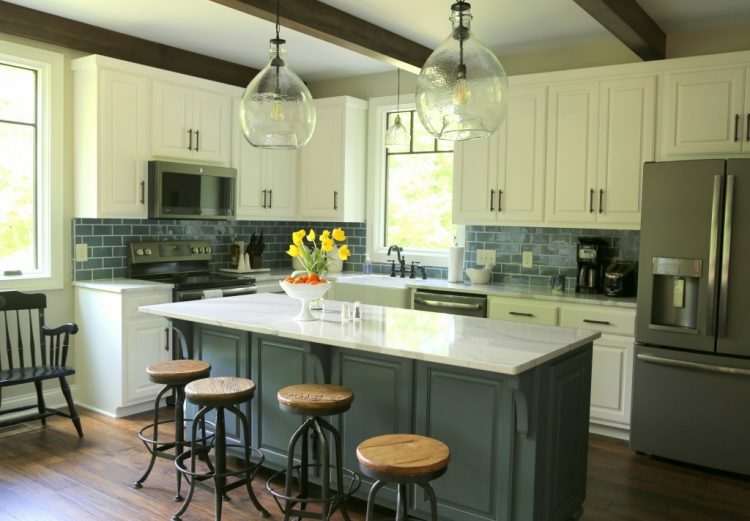 I have been going back and forth between antique glazed or white and now I think white might be a smarter choice along with setting up a color consult with you! ? That first countertop is horrible! Thank goodness you saved her! love the countertops and the whole design! hope you had a great mother’s day, kristie! When you’re right, you’re right! Thank you! Beautiful Kitchen! Thanks for all your inspiration. My husband and I are getting ready to rehab and country home and I have been debating putting my cooktop in the island. In the past I have had the stove placed as it is in the kitchen above. The downside is anytime there is a lot of steam the cabinets get very wet and overtime it does damage, even with the best hood ventilation. What are you thought on this topic? Thank you. I’m not sure I have an opinion here – I’m certainly no chef, but I haven’t ever had that issue. I don’t think your cabinets should be getting so wet – and if they are, a quick wipedown with a kitchen towel would prevent any damage I would think. Maybe it’s more a ventilation issue?? Very nice (as always), Kristie! Love this Kristie. 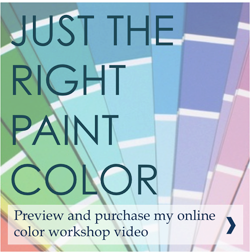 Just purchased your paint tool kit. 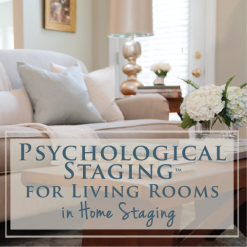 Looking forward to using it in my Real Estate/Home Staging business. 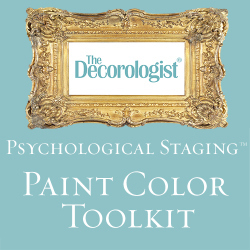 Hi, Kristie – followed a Pinterest link to this page. 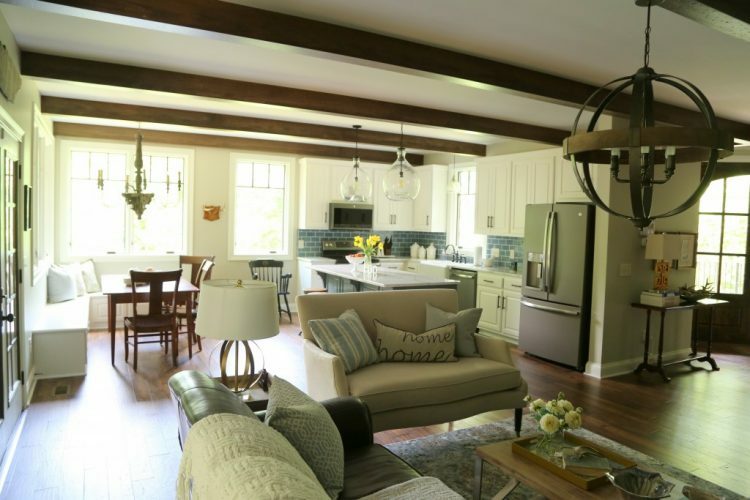 LOVE, LOVE, LOVE the light fixtures, over the island and the sink. 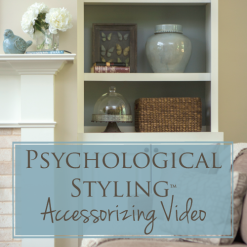 Could you please share mfg and style? Sorry, Karen – those light fixtures are only available to the trade, but I’m sure you can find similar fixtures in retail outlets! 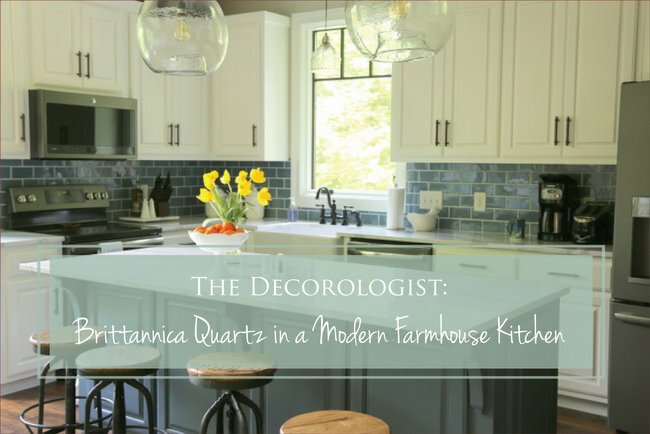 I am using the britticana quartz for my kitchen do over!! I am struggling with what to use as a backsplash. I had planned a traditional white subway with a gray grout or a gray glass subway with white grout. Which way would you lean? Please advise!! Thank you. 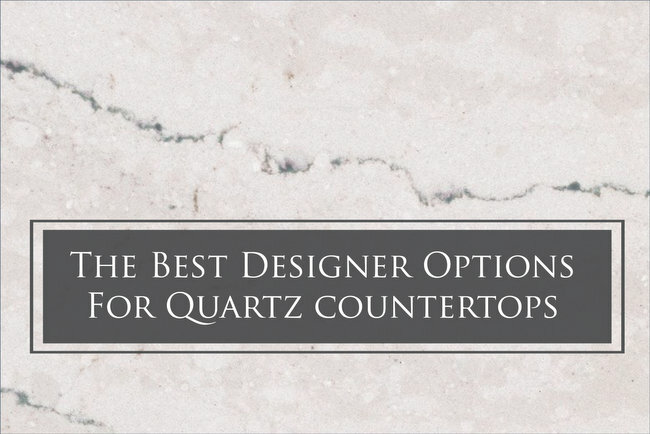 Receiving conflicting info re thickness quartz countertops. Who to trust? 2 cm v. 3 cm? Want sleek, modern look, not chunky, but need to ensure safety & durability. What do U recommend? Using light color, shade of white. Thanks. 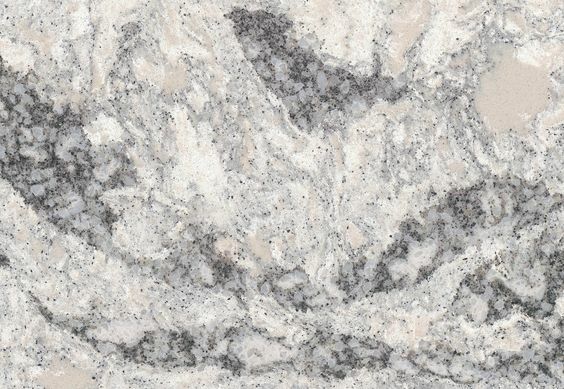 I’m thinking of using the Cambria Britannica on grey kitchen island and another color on main counter tops – a light quartz with less movement…can you suggest a good pairing to the Britannica? I will have white upper and lower cabinets on perimeter with the grey island. I’m trying to decide if I should do a shaker cabinet or one with a little more detail but not heavy detail – we have a 1932 Colonial. And can you suggest a back splash to go with that combo? Thanks!!! I’m thinking of having the brittannica quartz in my new kitchen redo with chocolate cabinets and white subway tiles set in a herringbone design. What are your thoughts on that? Do you mean stained cabinets, or painted cabinets? 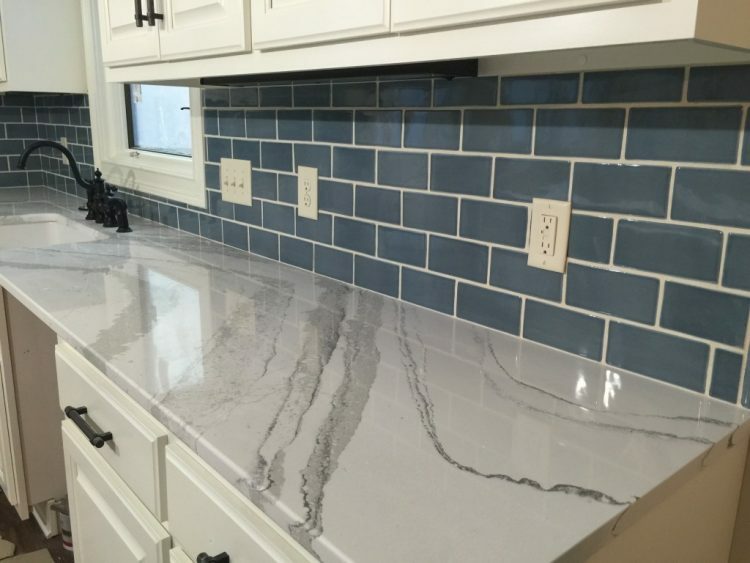 If stained, I think that sounds good – you may want to do a light gray grout in your backsplash tile to tie in with the gray in the countertop. 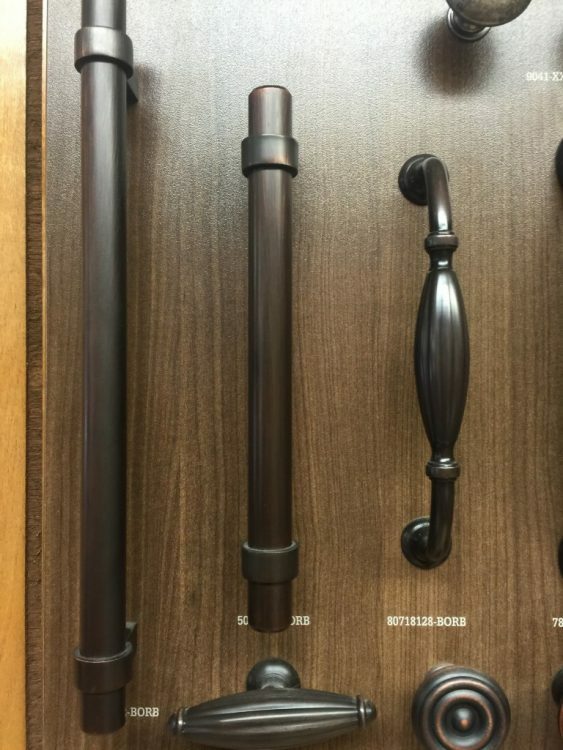 I would NOT advise painting cabinets in a chocolate color – it will just look like you are trying to copy the look of wood and will come off cheap. 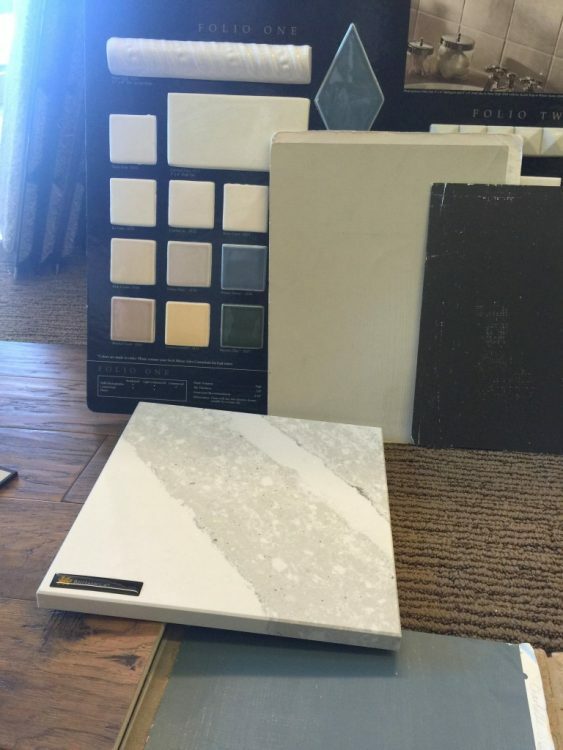 Instead, I’d advise a nice warm white or off-white that pairs well with the countertops. BM White Dove is the perfect complement for Summerhill! 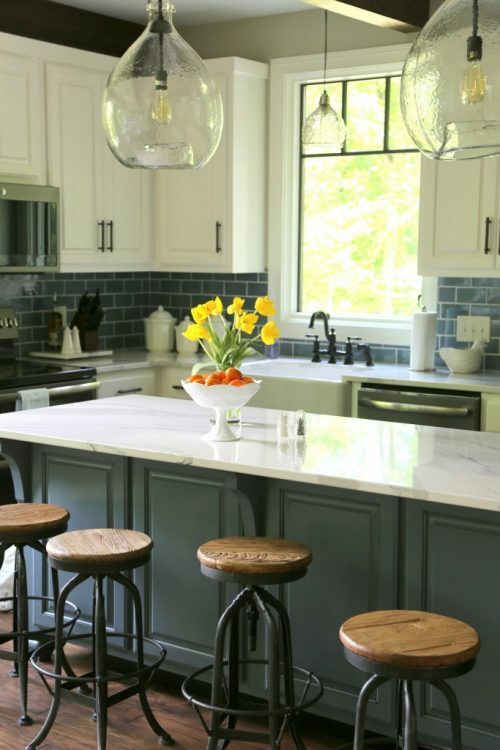 Painting that island out in BM Amherst Gray would be perfect for it, too – that’s what I’d suggest!!! How was the seam when you used Brittanica in the kitchen? With such a large pattern of movement, I would think the 90 degree on the perimeter would be noticeable? How was the seam when you used Brittanica in the kitchen? How do you feel about Quarter sewn red oak finished in cashew stain. It’s a beigey grey color. I had my heart set in Danby Imperial countertops but my wallet is crying. Do you know of a comparable option? I’m also curious to see how the seam in the corner looks. My biggest fear in my kitchen with using something like Britannica would be how the two corners in my kitchen would look. This would largely have to do with the quality of the install/installer. Be sure to use a reputable company and have them do a computer rendering of the slab and how the pattern will meet at that seam. Beautiful design! 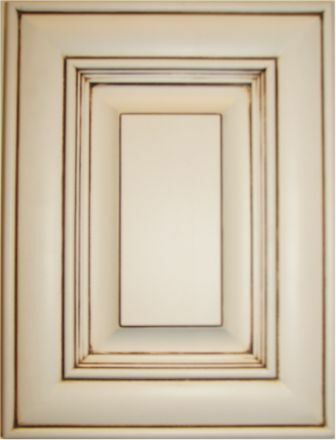 Can I use White Dove for my Cabinets if my crown moulding is also White Dove? I was looking at doing China White because a painter said I shouldn’t do the same color, but when I tested it, it looked a little too white next to the Cambria Brittanica counters (which I just had installed and LOVE)! White Dove seems like a nice warm white, as you mention. So can I just have cabinets and moulding/trim all Dove White? Thanks! You absolutely should always do the cabinets and trim the same white if possible. I can’t figure out why anyone would recommend two different whites – seeing them next to one another makes one (or the other) look dirty. White Dove all the way! Best of luck on your kitchen project. Thank you so much for your expert advice! I’m now feeling confident with White Dove. You are so nice to help me- and so quickly! You are very welcome, Jacki!